While low plasma melatonin, a neuro-hormone synthesized in the pineal gland, has been frequently associated with autism, our understanding of the mechanisms behind it have remained unclear. In this exploratory study, we hypothesized that low melatonin levels in ASD could be linked to a decrease of the pineal gland volume (PGV). 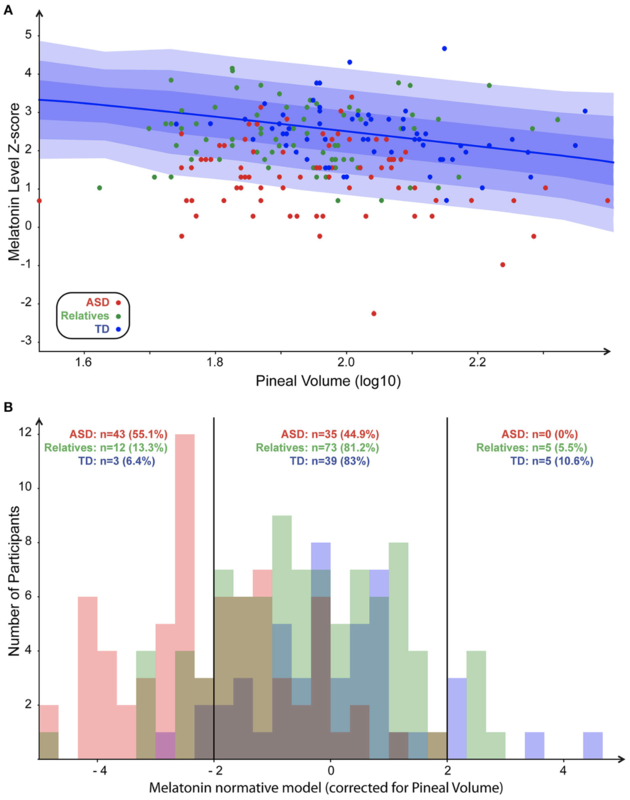 PGV estimates with magnetic resonance imaging (MRI) with a voxel-based volumetric measurement method and early morning plasma melatonin levels were evaluated for 215 participants, including 78 individuals with ASD, 90 unaffected relatives, and 47 controls. We first found that both early morning melatonin level and PGV were lower in patients compared to controls. We secondly built a linear model and observed that plasma melatonin was correlated to the group of the participant, but also to the PGV. To further understand the relationship between PGV and melatonin, we generated a normative model of the PGV relationship with melatonin level based on control participant data. We found an effect of PGV on normalized melatonin levels in ASD. Melatonin deficit appeared however more related to the group of the subject. Thus, melatonin variations in ASD could be mainly driven by melatonin pathway dysregulation.